A 5v5 multiplayer online battle arena, or MOBA for short, League of Legends is a hot game in the competitive esports scene, attracting gamers from all parts of the earth and – equally importantly – the eyes of investors and professional esports teams. Residing in North America alone, Team Liquid, Team Solo Mid, Echo Fox, and Cloud9 remain the dominant and most popular in the region. Did you know that in addition to playing yourself and watching your favorite teams, you can also bet on League of Legends? That's right -- you have the chance to back your favorite players and teams by signing up with the right online sportsbook and putting your money on the line. Whether you're new to the scene or a persistent follower of the game, it is essential to choose the right sports betting site. 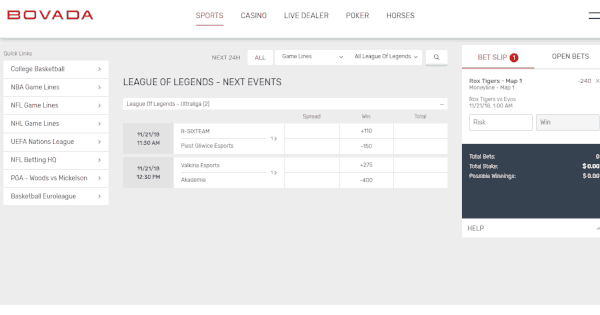 While there are quite a few stellar sportsbook services, many of them don't offer the option to place wagers on League of Legends. Moreover, some operators are disreputable, having slow payments, exorbitant payout fees, and other problems that make it unwise to bet with them. There are numerous ways for you to bet on the sportsbooks we are about to mention. The standard, of course, is to predict the outcome of the contest in regard to who wins and who loses. After that, it starts to become interesting. Some sportsbooks offer the outcome of even or odd kill totals in one match, who achieves the first blood or first kill, and also which team will get to 10 kills first. A few sites even permit live betting where you can continue to wager even after a competition has already begun. We want you to be able to enjoy a diverse selection of betting possibilities at a reputable internet bookie that will treat you fairly. Therefore, we've conducted thorough research into the sites that provide League of Legends betting and have evaluated their services. 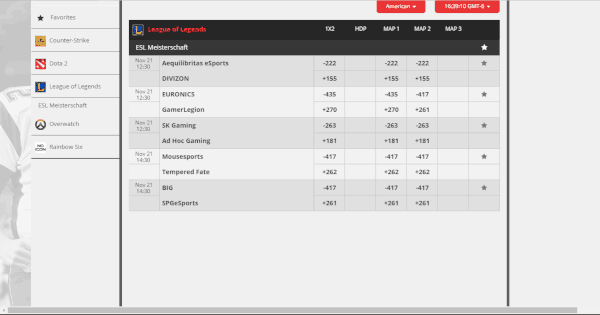 Here are ProfessionalRakeback's top three betting sites for League of Legends. Sportsbook, poker, and casino, oh my! In all categories, Professional Rakeback gives much praise to Bovada.lv. 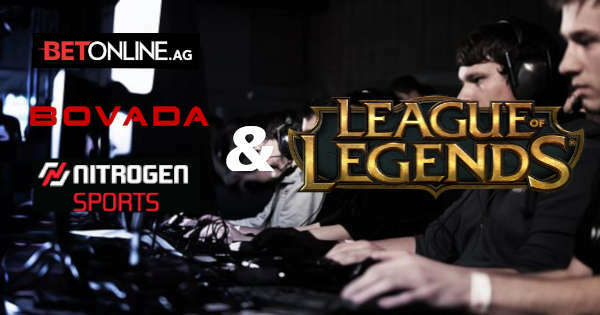 Here, we will shine some light on Bovada sportsbook's League of Legends betting options. Be aware that upon making your first deposit, you'll qualify for a 50% up to $250 bonus with a 5x rollover on the sum of the deposit amount and bonus. This is a good way to boost your bankroll regardless of the results of your actual wagers. At Bovada, you can try to predict who will win a League of Legends match with a moneyline wager. In some cases, it's also possible to bet on the outcome of individual maps. For those who enjoy the thrill of live betting on matches as they progress, this site does offer that option. Bovada also has a “Futures” section for bettors who try to predict, well in advance, who will win big sporting events. This is the case for League of Legends as well, so if you think you know who's going to triumph in the upcoming World Championship for LoL, then you can make your guess here. Needless to say, you can bet on NFL, MLB, NCAA, NHL, and various other professional and collegiate athletic leagues too. The sports bonus is valid for use on all of these types of contests as well as League of Legends and other esports. Then when you want to sample the other gaming that's available, a casino with a live dealer section awaits you as does the poker room – the largest online poker venue presently available for residents of the United States. When funding your account, you can deposit via credit card, but we heartily prefer crypto-currencies instead because they're always fee-free at Bovada. The site accepts both Bitcoin and Bitcoin Cash, and in fact, if you deposit with crypto, the 50% up to $250 sports bonus doubles to become 50% up to $500. These same digital currencies are available when you withdraw your money – up to $9,500 at a time. It's possible to instead request that a check be sent to your address, but each check beyond the first in a 90-day period incurs a $100 fee. Ouch! Transact in crypto-currency instead to avoid this surcharge. If you wish to know more about this upstanding online gaming site before signing up, check out our comprehensive Bovada.lv review page. Bovada only accepts customers from the United States, so those from other parts of the world cannot open new accounts. However, its sister site Bodog provides almost the exact same League of Legends betting experience to Canadians and Latin Americans. So if you live in either of these parts of the world, browse over to our Bodog poker, sports, and casino review to learn more. BetOnline is the sister site of Sportsbetting.ag and one of the largest online sportsbooks for USA residents. Unfortunately, there's no sign up bonus for LoL bettors because the site's normal sports betting offer of 50% up to $1,000 is only valid on certain types of contests, and esports is not one of them. Still, if you enjoy betting on other types of contests, then this free money is waiting for you. When it comes to betting League of Legends at BetOnline, there are numerous ways to do so. Placing a moneyline wager on the outcome of a series, tournament, or an individual match is popular on this site. BetOnline even has a category for live betting – this gives you the chance to place wagers on certain outcomes as the match progresses. One can also place bets on who will win the first game of the set and more depending on the format of the tournament hosting the League of Legends event. Betonline sometimes lists upcoming events a week ahead of time, giving you ample opportunity to get your wagers in early. BOL does not limit your wagers to just League of Legends. There's also a traditional sportsbook, which contains NFL, NBA, MLB, and many more professional and collegiate athletics. The esports section is where you'll find League of Legends as well as many other popular competitive video games. That's right; you can follow and place wagers on events for CS:GO, Dota 2, Hearthstone, and other titles. This coverage includes exhibitions, world championships, and other big events. To fund your account, BetOnline offers a sizeable selection of methods. You are able to use Visa or MasterCard, money order, and bank wire just to name a few. Here at PROFRB, though, we always recommend the use of cryptocurrencies for their efficiency. Using Bitcoin, Ethereum, Litecoin, Dash, Bitcoin Cash, or Ripple for transactions on your account grants you the lowest fees among all the deposit and withdrawal methods on BetOnline. This was just a brief overview on Betonline and its applicability for League of Legends bettors. Check out our Betonline poker review for a more in-depth guide on the company's assorted gambling products. We also provide an extensive review on BOL's sister site Sportsbetting.ag here. Nitrogen has always been a solid sportsbook website and it added poker in late 2014. You're only allowed to deposit and withdraw in BTC here. This may appear limited, but the pros outweigh the cons in how fast you're able to fund your account and get coins paid out back to your wallet. Indeed, Nitrogen is one of the leading companies in the Bitcoin sportbooks market. Among its selling points, it boasts an easy to use interface, low-juice odds, and a variety of sports categories to choose from. Nitrogen allows you to bet on a number of esports events, such as Dota 2, Warcraft 3, Starcraft 2, and, of course, League of Legends. With these games in mind, Nitrogen covers an abundance of competitions and tournaments with the inclusion of regional and other small events. Typical match betting offers moneyline and spread odds. You can also bet on individual maps or games as to which team will win, who will get first blood or first kill, and the total amount of rounds that will be played before the match is over. Other than esports, Nitrogen does give you the option to place bets on beloved leagues like MLB, UEFA, MMA and NBA with a mix of other niche sports: chess, darts, and handball for example. Aside from all the accolades, nitrogen does not offer many promotions upon sign-up, but it provide ongoing specials, like the infamous monthly parlay jackpot competition. How it functions is there are three separate leaderboards, divided by bet-size, that reward the top seven users with the highest parlay paydays during the month, and esports parlays count fully. Nitrogen Sports also periodically announces time-sensitive promos on its blog and Twitter feed. With a watchful eye on these resources, you'll be able to participate in deals including, but not limited to, bracket prediction in certain sports events, free bets on esports super major events, and social contests. Nitrogen has climbed the ranks to become the top Bitcoin-only betting website that offers sports betting, poker, and casino gaming. To answer any questions or concerns that you may have in relation to Nitrogen, feel free to check out our detailed Nitrogen Sports review. 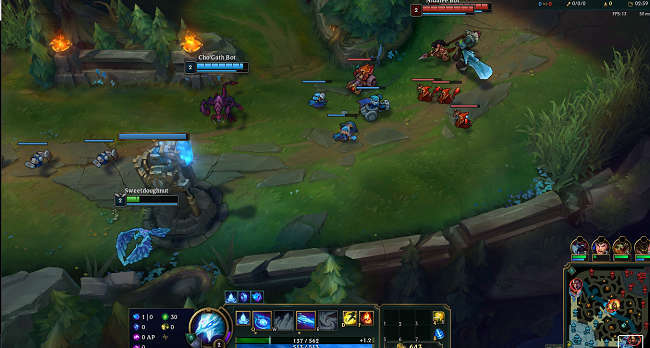 League of legends, or LoL, is a team-based RTS with a dash of RPG implications. In competitive settings, two teams of five duke it out on the Summoner's Rift. There, each team starts at their home base and pushes, alongside waves of minions given by the Nexus, into the enemy's home base. Combat erupts in the middle of each of the three lanes as well as the jungle that surrounds each of the lanes. Of course, team synergy and the roles of the heroes are a key factor to success. Team compositions usually consist of: one tank, one jungler, one mage, one support or healer, and an attack damage carry. Match times may vary with an average between 20-45 min. After the 15-minute mark, a team can surrender with the agreement of at least four of the five team members. LoL has been a free-to-play and free-to-download game ever since its launch in 2009. Developed and produced by Riot Games, the title was only available on Windows PC upon release but has been adapted to become open to Mac users too. Originally starting off with 40 playable champions, League has grown in size over the years with a whopping 141 champions now playable! With the help of a number of game modes, League provides a ton of content and replay value. You have the option to play on the Twisted Treeline: a two-laned map that puts two teams of three against each other and offers faster, thrilling gameplay. There is also the Howling Abyss map, also known as "All Random All Mid" or ARAM for short. This map is a single-lane platform that pits two teams of five with, you guessed it, all random champions. Lastly, there is the Summoner's Rift. The most popular and competitive game mode that League of Legends has to offer. The Summoner's Rift map is a staple of the competitive format of all LoL esports events. League of Legends has experienced a rapid increase in popularity ever since its esports debut in 2011. The excitement of the game has caught the limelight, attracting many online viewers and gamers alike. With at least 16 active teams in North America alone, tournament results can be unpredictable, and frequent upsets have been known to occur. As prominent as League of Legends is, it's no surprise that top competitive teams also exist all around the world from Brazil to Europe and the Asian powerhouses Korea and China. There are other regions and countries that boast great teams, of course, adding up to 100+ professional League of Legends teams worldwide. When it comes to the future of League of Legends, it will never be the same game each season of competitive play. In order to maintain such a diverse competitive format over eight seasons, the developers have implemented a series of patches and reworks. Past, present and future, it seems these changes to the game are eminently responsible for its continued appeal. Some pro players do frown upon the constant adaptation that they have to do throughout the year, but for most fans, this constant change maintains a refreshing meta as opposed to a stagnant one. Whether it comes to new busted team comps, exploits being discovered, or just something to mix up the metagame, the ever-changing League of Legends will likely remain relevant for a good while to come. If you still have any unanswered queries about betting on League of Legends over the internet, then look below. We've collected some of the most common questions and have endeavored to address them in a thorough and accurate way. How do I read the betting odds at sportsbooks? This means that if you wish to back Team A, you would have to bet $130 for every $100 you stand to win. On the other hand, if you like Team B, you'll receive $110 in winnings for every $100 you bet if Team B prevails. There are other odds formats, like decimal and fractional, but almost every sportsbook allows you to display lines using American odds from within the settings menu. How do I know I will get my money if I win? All of the sites we work with have a history of fair dealing and honest payments to winning customers. We don't just take their word for it either. Every month, we publish an offshore gaming sites payout report explaining the various cashout channels available at each operator and how long it takes for users to receive their withdrawals. How can I use crypto-currency to bet on League of Legends? When is the match over in a best-of-three or best-of-five competition? Best-of-three is a format that states that whichever team or player wins two out of the three games first wins. The format could also be named "first-to-two," implying that once a team reaches two wins, it's over and that team is declared the winner. This same logic applies to the best-of-five format. In this case, up to five games can be played, but you must win three games rather than two. Who are the most famous League of Legends players? There are many pro players who also stream League of Legends gameplay. Shiphtur is a well-known LoL player who would also qualify as famous. He made his debut on the esports scene in 2012, and you can now find Shiphtur playing as part of the "Meme Stream Dream Team" alongside his comrades (Yassuo, VoyBoy, Scarra, and Imaqtpie). Where are the most prestigious League of Legends contests held? LoL World Championship events have been hosted in many regions. The first World event was held at Stadsparksvallen Stadium in Jönköping, Sweden. The event has in subsequent years traveled to stadiums in Los Angeles, like USC's Galen Center in 2012 and the iconic Staples Center in 2013. As of 2018, the latest World Finals event was held in Incheon, South Korea, at the Munhak Stadium. There are also big-ticket events that aren't held year-round. Seasonal championships and even invitationals can bring in viewers and fans alike. They are usually held at stadiums and auditoriums that can accommodate large audiences. Events like these offer the same high-octane gameplay to scratch that itch while you wait for Worlds. These events and Worlds are no strangers to big online viewership. If you can't make it to the event in person, there is always the live-stream option. Why is only the Summoner's Rift map used in major competitions? The Summoner's rift map is not only omnipresent in the tournament circuit but also a favorite of the online community. The flow of the game evolves in a sophisticated fashion that not all other game modes can provide. In the early stages of the match, you can find teams separated throughout three lanes, pushing and pulling each other, trying to get an edge. You can occasionally see small skirmishes in each lane – sometimes in the jungle – seeking to obtain certain objectives. Then during the later portions, you can see all the early parts of the game accumulate and contribute to larger-scale team fights. What are the differences between the various playable characters? Characters are separated usually by the archetype and roles they are built for. You have the tanks, which are usually the ones soaking up damage and controlling the direction of the team fight. Supports are characters that can provide utility to their team whether in shields, heals, or crowd control. There are mages that hang in the back lines and deal damage through their arsenals of spells. Then lastly, you have the attack damage carry. Usually a character within this category relies on basic attacks to do the most damage and is a key target that can sway the game at any time if left unchecked. Is there user-created content or mods for League of Legends? Riot does not prohibit the use of third-party mods. There are mods that you may use at your own risk. Such innocuous mods as those that involve custom voice packs and alternate skins can be applied. We do recommend that you proceed with caution if you want to use mods at all. Some may improperly flag the instant feedback system built into the game, which can lead to your account being permanently banned.